Nearly 300 people honored the legacy of U.S. 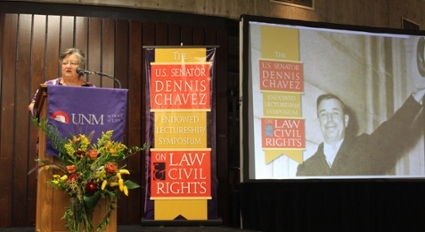 Senator Dennis Chávez at the UNM School of Law on October 26. The Honorable M. Christina Armijo, Chief Judge of the United States District Court for the District of New Mexico, presented the lecture for the U.S. 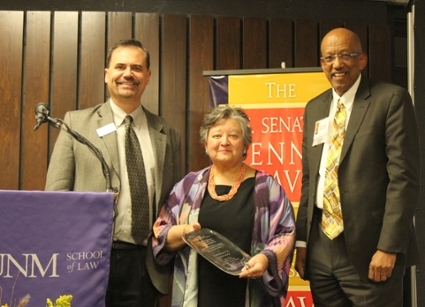 Senator Dennis Chávez Endowed Lectureship/Symposium on Law and Civil Rights. Chávez was a remarkable New Mexican, a populist from the South Valley who served a noteworthy and significant term in the U.S. Senate from 1935 until his death in 1962. He is remembered as a pivotal and early advocate of civil rights legislation. Gloria Tristani, one of Chávez’ grandchildren, said his life and legacy are a powerful reminder that the struggle for civil rights and social justice and against discrimination is always with us. “And that no matter how unpopular, we must always have the courage to raise our voices to speak to truth and stand up for the rights of others,” she added. UNM School of Law Co-Deans Sergio Pareja and Alfred Mathewson present an engraved Nambé platter to the Chief Judge. Her lecture reviewed the choices he made, their challenges and consequences, and his courage and resolve in safeguarding the rights of individuals. Armijo encouraged attendees at the lecture to take an interest in their community and become meaningful participants, no matter how small the effort is. Cissy Coy, another of Chávez’ grandchildren, recently wrote a book about him titled, “Dennis Chávez: The First Hispanic US Senator.” The book is for intermediate readers and is available on Amazon. 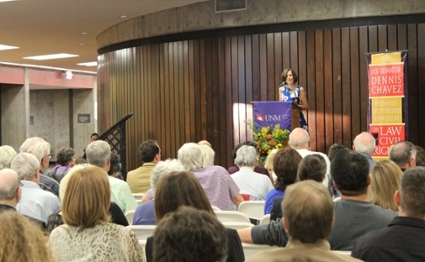 Read the Daily Lobo story about the lecture by Nichole Harwood here. 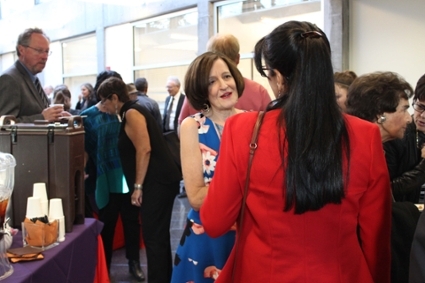 Gloria Tristani, a granddaughter of Senator Dennis Chávez, chats with a guest during the pre-lecture reception. 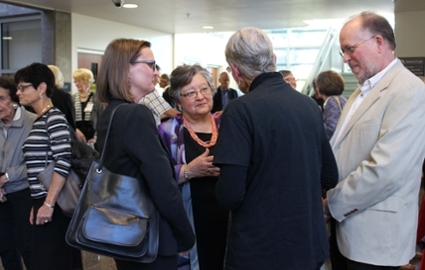 The Honorable M. Christina Armijo (center) speaks with guests before presenting her lecture. Tristani says Chávez was never afraid to speak the truth and that’s one of the reasons his work is relevant today. Former Dean and Professor of Law Kevin Washburn receives flowers to give to Tristani, whose family endowed the lecture in Fall 2009.